What antibiotic is best depends upon your infection’s location and severity, and ideally an antibiotic sensitivity test. There are many antibiotics that work for treating Staph infections, which are a common cause of doctor visits for skin and soft tissue infections. What’s the best antibiotic for Staph? The type, location and severity of your infection all help determine which antibiotic is best for you. Other factors that come into play when choosing a Staph antibiotic are: pregnancy, drug allergies, other medications being taken and other health risks. As you’ll see in the section below, the most accurate way to prescribe an antibiotic is to get tested to identify the best antibiotic that will work against your particular infection. Most of the above antibiotics are for less severe Staph infections. MRSA is resistant to the B-lactams listed above. Fortunately, Staph is generally easy to treat and antibiotics prescribed will generally work. If you have a mild Staph infection, antibiotics may not be required, and treatment may instead include wound incision, drainage or warm compresses (click here for more info). However, for serious infections, your Doctor will likely prescribe an antibiotic. Be sure to get educated about the side-effects and risks below. Unfortunately, Staph infections can sometimes turns into MRSA, which is a type of Staph that has become immune to common antibiotics. If MRSA does develop, special antibiotics for MRSA are the best conventional treatment option. Also consider alternative remedies for Staph, which are often just as effective as antibiotics, and they don’t carry all the negative side-effects or resistance issues. 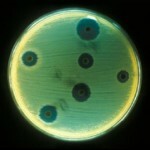 A agar plate showing an antibiotic susceptibility test. One of the best ways to make sure you get the best antibiotic is by getting a susceptibility test (or an antibiotic sensitivity test). This test will determine what antibiotics actually work against your particular type of Staph infection and it will guide your doctor to the best antibiotic choice. Many doctors will prescribe a drug based on their clinical experience, standard protocol or by trial and error, not by actual testing you to see what type of bacteria is causing your infection. This often leads to failure of the drug to work. If you have a history of recurring Staph, of if your treatments are not working, getting tested can be even more important. Staph can progress into a MRSA infection, which will not respond to common antibiotics. Antibiotics for Staph can be taken orally, topically or intravenously (IV), depending on the type of antibiotic. IV antibiotics can be administered for six weeks or more depending on the infection. Intravenous antibiotics may also be used to treat Staph infections around the eyes or on other parts of the face. More serious and life-threatening infections (typically MRSA) may require using intravenous antibiotics such as Vancomycin. If the correct antibiotic is prescribed, infection relief can occur very quickly. If you are prescribed antibiotics, be sure to take it on schedule for as many days as your doctor directs you, even if you begin to feel better. It’s important to know that misdiagnosis and improper use of antibiotics are common with Staph and other infections. Antibiotic use often carries with it many side effects and your doctor probably won’t discuss these risks with you. Most antibiotic drugs have significant negative side effects, which can include: diarrhea, hives, yeast infections, upset stomach, nausea, vomiting, depressed white blood cell counts (immune cells), rashes, and more. Consult your physician if you are pregnant or breast feeding. Many people can not take antibiotics because of the severe side effects. RxISK.org is a free, independent drug safety website where you can research your antibiotic for ALL of the side effects that actual people are experiencing. You can also report your side-effects. Click here to go RxISK.org. If you are pregnant you should also strongly consider alternatives to antibiotics because of health issues correlated to the developing child. Parents should be especially cautious using antibiotics on children as I believe they can, especially with overuse, contribute to many chronic illnesses. Why? Antibiotics will kill off many of the “good” or friendly bacteria inside the intestines along with the “bad” bacteria of the infection. This disruption of the natural bacteria balance in the body can cause intestinal problems but importantly, they also weaken the body’s immune system, thus increasing the chances of getting re-infected later. You have an entire army of bacteria that work to keep you safe and healthy, and antibiotics kill both the bad and the good bacteria leaving your body compromised. Antibiotics are the medical treatment of choice for Staph, however, growing antibiotic resistance is a serious issue. The overuse of antibiotics over many years has resulted in the ever growing population of antibiotic resistant bacteria, such as MRSA. Antibiotics have become less and less effective with each passing year. Such misuse has been created by doctors prescribing antibiotics for colds which are caused by viruses, not bacteria. The commercial livestock industry has overused antibiotics which are commonly used to fatten cattle so they can go to market quicker, making these drugs less effective for people. These two factors have greatly contributed to antimicrobial resistance in bacteria like Staph. While antibiotics are often necessary and lifesaving, I believe they should be used with prudence. Antibiotics have a history of being misused and over-used which has contributed largely to antibiotic resistant bacteria like MRSA, VRSA and others. Statistics are now showing that using antibiotics for a Staph infection can double your chances of getting MRSA. Using an antibiotic that doesn’t work well only makes these bacteria more resistant. I’m not saying this as a scare tactic, but I want to inform you of the risks involved with antibiotics and if you’re going to use them, make sure you get tested. I would consider alternative approaches instead of antibiotic treatment if an infection is not serious or life-threatening. If the infection is serious or life-threatening, I would look at using these other approaches in conjunction with antibiotic treatment. Talk with your Medical Doctor, Infectious Disease Doctor or ideally an Alternative Medicine Doctor about using antibiotics as a “backup” option if at all possible.